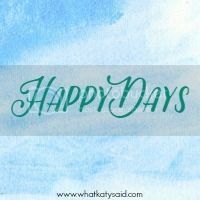 Welcome to my new post series Weekly Happy List. Monday rolls round quick doesn’t it? Not just Monday actually, I just blinked and my kids turned 5 and 2.5. My eldest started school in September and soon it’s Half Term. When did that happen? It’s high time to get back to basics. When I started this blog I was suffering with Post Natal Anxiety and the effects on that seeped into my (our) whole life. Unable to go out that much or join in with playgroups, the burden of responsibility of looking after two young children was robbing me of joy. So I started this blog, to mindfully choose to celebrate the little things, the mundane things in a way. These are actually the big things, when we look back and our children are grown up, the little things are the big things. So I’m starting a Weekly Happy List which will also help me to remember these things that make up the fabric that in turn makes up the tapestry of my little family and the things we love; right here, right now. I’m going to start with joys from last week as last week was a great week! My sister Rosie and her 7 week old baby E came down to stay with Mum and Dad it was so nice to see them! Going to Bath for the day with my Mum, sis, baby E and SB and being treated to tea and cake in the Pump Rooms. SB had a chocolate cake the size of her head in the Pump Rooms and approached it like a pro. SH excitedly telling us about the school labyrinth, all the classes took turns to help build it. SH telling me more and more ‘I love you mummy’. How SB strokes my hair and cups my chin with her hand. Not so sure about the full on snogs though! Me and Jon celebrated our 7 year wedding anniversary at Little Barwick House in Somerset, literally 5 mins drive from our house! Half Term starts on Friday! Have a great week all! Enjoy the little things. It’s so nice to read lists like this that celebrate the small things – I live in London where I normally feel completely invisible but since I started looking up and smiling more I have found that people actually seem happy to engage and smile back. I had no idea that was all it would take!